Similar to gingerbread, Lebkuchen(A German biscuit) is easy to make and a delicious Christmas treat! * If you can’t find candied citron (which can be hard to find some years), add additional candied lemon or orange peel plus a small pinch each of ground cinnamon and black pepper to stimulate citron’s slightly spice, more complex flavor. Preheat oven to 375 degrees F. Lightly butter an approximate 12″ x 17″ x 1″ baking pan. I have found that lining the baking pan with parchment paper, allowing it to overhand on all sides, makes for an easier removal of the bars when cut. In a very large bowl, combine flour, salt, baking soda, cloves, cinnamon, almonds, candied citron, and candied orange peel; set aside. In the top of a double boiler over hot water, combine honey, sugar, and whiskey; stir until sugar is dissolved. Remove from heat and let mixture cool a little until just slightly warm. Add the beaten eggs, a little at a time, beating well after each addition; add to flour mixture and mix until well blended. Spread batter onto the prepared baking pan, smoothing the top with the back of a large spoon or rubber spatula. Bake 18 to 20 minutes or until toothpick inserted in center comes out clean and they are light brown. Remove from oven and place on a wire cooling rack. While bars are baking, prepare the Milk Frosting. While the Lebkuchen is still hot, spread the prepared Milk Frosting onto the top of the baked Lebkuchen with a spatula or a pastry brush. Let the Lebkuchen cool completely. 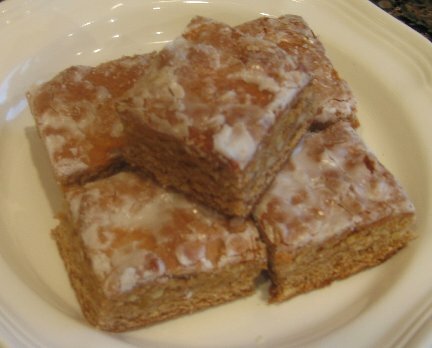 Cut into bars, and remove from pan. Store, tightly covered, at room temperature to let mellow. These cookies get even better with age (if you can wait to eat them). Ideally you should allow them to age for 1 to 4 weeks (or even longer). In a small bowl, combine powdered sugar and enough milk to make frosting easy to spread.